Enjoy magnificent views over Banks Peninsula, the Canterbury plains, Southern Alps and Pacific ocean on this track, which is about an hour's drive from Christchurch. Parts of the track are closed for lambing from August to October – check closure dates for track sections below. Note: The following description covers the walkway from Kaituna Valley to Hilltop, but other access/exit points are possible and noted where relevant. Te Ara Pātaka/Summit Walkway links Kaituna Valley in the Lyttelton crater to Hilltop in the Akaroa crater. It follows a long high ridgeline that includes Mt Herbert/Te Ahu Patiki, the highest point on Banks Peninsula. The track can be completed as a one-way walk most of the year (part of the track is closed during lambing). The Kaituna Valley Packhorse Hut Track is a well signposted track that passes through a farm, following vehicle tracks up a native bush-filled valley. The track ambles through pasture and then forest, crossing the valley stream several times. In the summer you can use stepping stones to cross, but be prepared to get wet feet if the stream is up after rain. There are great views along the track of Kaitorete Spit and the South Coast, also Lyttelton Harbour, Quail island and the Port Hills. Mountain biking is not allowed. This track is open year round but all other tracks to/from Packhorse Hut are closed for lambing from 8 August – 15 October. Packhorse Hut to Mt Herbert/Te Ahu Patiki summit track crosses the Sign of the Packhorse Scenic Reserve with many young, regenerating lancewood trees. Head east through Sign of the Packhorse Scenic Reserve through many young, regenerating horoeka/lancewood trees. The track emerges from the reserve into open country and zig-zags steeply up the side of Mount Bradley, climbing 300 m. This is the toughest part of the track, so take a rest and admire the view of Lake Ellesmere (Te Waihora). After the last zig-zag the track heads east, skirting below the mountain's rocky massif through gorse, bush and regenerating scrub – you will have to pick over some rocky patches. The track emerges at a fence line on the pass between Mount Bradley and Mount Herbert. Cross at the stile and carry straight on near the fence. You will soon join a farm track; stay on the main track when a side track branches off to Orton Bradley Park. The Mount Herbert Shelter is a short distance along and has a toilet and water. From the shelter, return to the farm track. Turn right after about 400 m, up a smaller track that leads through gorse to the Mount Herbert/Te Ahu Patiki summit. If you miss this turnoff, there is another opportunity to reach the summit when the track from Te Waipapa/DiamondHarbour joins. There are stunning views from here on a good day. On a cloudy day it can be misty and confusing so watch closely for the track markers, which are closer together on this section. Track closed for lambing 8 August to 15 October. Mountain biking is not allowed on this section. From the summit of Mount Herbert, head south-east along the plateau through tussock grassland to reach the summit of ‘Little Mount Herbert’. Take great care in misty weather to follow the orange markers along the 1-km plateau between the two summits. You may encounter cattle grazing along the way. Give them space as you walk. From ‘Little Mount Herbert’, carry on south-east down a steep tussock slope, to pick up the marked farm track (punctuated by pine forest and old stands of remnant tōtara) to the Port Levy saddle car park on Western Valley Road. Port Levy saddle is at the top of Western Valley Road. This steep, narrow gravel road connects Little River to Port Levy. It is not suitable for campervans or towing vehicles, and can be difficult for 2WD vehicles after heavy rain. There is a parking area here providing easy access to Rod Donald Hut or Mount Herbert (if doing the track in reverse - Port Levy Saddle to Mt Herbert/Te Ahu Patiki summit). Port Levy saddle to Rod Donald Hut takes you through beautiful old growth tōtara forest at Waipuna Saddle and on to Rod Donald Hut which you can prebook for an overnight stay or visit as a day walk. Cross Western Valley Road and follow the marked track to Waipuna Saddle. There is a beautiful old growth tōtara forest at Waipuna Saddle. This is on private land, but the landowner permits you to visit it. Respect this very special place. Rod Donald Hut is down a side track and takes about 25 min to walk to from here. This section of the track is accessible by mountain bike, but bikes are best left at the top of the Rod Donald Hut track. 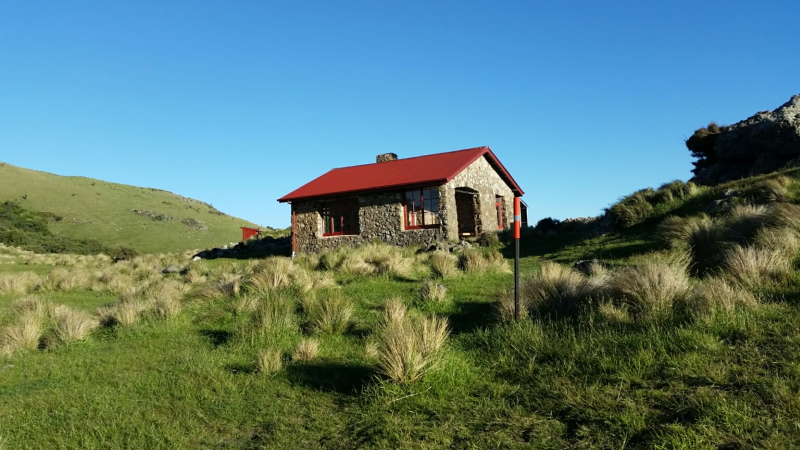 The Rod Donald Hut is on private land belonging to the Rod Donald Banks Peninsula Trust and protected by a QEII National Trust covenant. As with Packhorse Hut, bunks must be pre-booked through this website, but day walkers are welcome to visit. Mountain biking is allowed on this section but bikes are best left at the top of the Rod Donald Hut Track. Rod Donald Hut to Hilltop Hotel via Montgomery Reserve takes you through Montgomery Park Scenic Reserve onto Summit Road. From Rod Donald Hut, climb back up the access track to reach Waipuna Saddle. Then head east following the marked farm track through the tōtara graveyard, pasture and several DOC reserves. Mountain bikers leave the main track briefly to by pass the narrow rocky track through Mount Fitzgerald, and take an easier farm track. Soon after the Whatarangi Totara Scenic Reserve, the track diverges again. Walkers should head up to Montgomery Park Scenic Reserve and walk directly to Hilltop Tavern. The reserve track is steep and rocky, so take care and enjoy the beautiful forest including a giant tōtara, thought to be up to 2,000 years old. The track emerges from the reserve onto Summit Road. Keep children close and take extreme care to look and listen for vehicles as you cross the road. Mountain biking is allowed on this section, but are not permitted in Montgomery Park Scenic Reserve. Follow the farm track to Pettigrews Road; turn right at the end to reach the Summit Road, and right again to ride along the Summit Road. Te Ara Pātaka is best accessed by car, preferably by leaving a car at each end of the track. Allow 50 minutes to drive from Christchurch to Gebbies Pass, or 1 hour 15 minutes to Hilltop as the roads are steep and windy. If parking at Hilltop, leave vehicles at the furthest end of the car park from the tavern itself. Connecting tracks enable shorter loop walks, and public transport is available from Te Waipapa/Diamond Harbour and Hilltop Tavern. Akaroa Shuttle and Akaroa French Connection provide services between Christchurch and Akaroa, and can stop or pick up at Hilltop Tavern on request. If you book to catch the bus at the end of your walk at Hilltop, let them know to call at the Tavern. Be there 15 min after the bus departure time from Akaroa. It is an excellent 2-day trip using public transport starting at Diamond Harbour jetty, staying overnight at Rod Donald Hut, and catching a shuttle from Hilltop Tavern back to Christchurch. You can also reach Te Ara Pātaka via several connecting tracks, including the Gebbies Pass to Packhorse Hut, Mount Herbert Walkway, Tablelands/Faulkner tracks and the Monument Track (both north and south). The track can be picked up at Port Levy saddle, via Western Valley Road. Drive carefully: this unsealed road is winding, rough, steep and narrow. After heavy rain it may be passable only by 4WD vehicles. Pettigrews Road entry/exit for Mountain bikes. For more information on these, see the Rod Donald Banks Peninsula website. Packhorse Hut and Rod Donald Hut must be booked in advance. Book online or contact the DOC office. The track is suitable for people with moderate backcountry skills and experience. It's rough and steep in places. Although the walkway is easily accessible the weather can change quickly, and it can be very cold and exposed on the tops. The track is exposed to all weathers. It can be windy, cold and prone to low cloud in poor weather. Make sure you are well equipped, with layered clothing and a water/wind-proof jacket. Drinking water and toilets are only available at the huts and the Mt Herbert shelter – you must take water with you. All tracks cross private farmland, so keep on the marked tracks and respect the working operations on the farms. Leave gates as you find them, taking extra care in large groups. Mountain bikes are restricted to some tracks only. Firearms, motor vehicles or fires are also not permitted anywhere on this land. On a warm February weekend Sam Rowland and Kate Alderslade explored Te Ara Pātaka — they share with us 10 reasons to visit this magical spot.